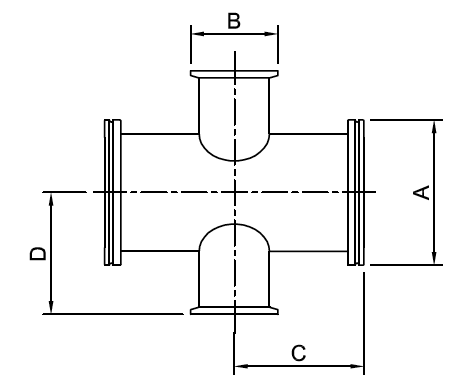 ISO to KF Reducing Crosses are used to join two different Branch lines of various sizes into a single main line. Manufactured from: 304 stainless steel. Helium Leak tested to 10-8 mbar. ISO to KF Reducing Crosses are supplied in a sealed plastic bag and protected with plastic caps. ISO to KF Reducing Crossesare compatible with other supplier’s products and are manufactured to the ISO Standard.